During Christmas, your home is a winter wonderland, and greenery can make a home lively and elegant. While the Christmas tree is usually the decorative focal point, there are plenty of other greenery options to complement your tree and pull your design together. Prelit garland and wreaths save the time and effort of stringing lights, and our greenery gives a fresh look to any house or business. Use greenery to liven up any area for the holidays. Our Christmas wreaths range in size from 24" to 12' and can fit in any area. They're great for doors, windows, walls, mantles, columns and posts. Wreath hangers can be used to hang wreaths in many of these locations, and extendable floor hangers allow wreaths to be setup anywhere from tabletops to floor spaces. If your door is 35.5" wide, you'd want a wreath smaller than that measurement. 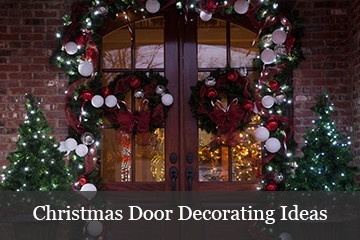 A 30" wreath would be lovely on the door, while a 24" might be dwarfed by the large door size. 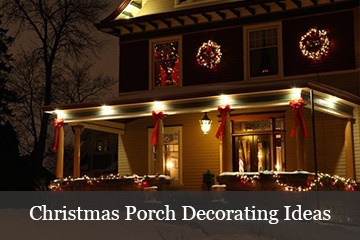 A 36" wreath would be too large and look unsightly as well as make the door difficult to open and close. Make sure that no matter where you hang your wreath, the width of the greenery is always smaller than the width of the hanging surface. For Christmas bows, take half of the size of the wreath and choose a bow approximately that size. In our example, we have a 30" wreath. Half of the 30" is 15", so a 14" to 16" bow would look nice. Bows can be positioned at the top or bottom, center or hanging off to the side of the wreath for an asymmetrical look. Decorative Christmas ribbon or ribbon lights. No matter where you put your garland, you're going to want the right thickness. Garland too thin won't be noticeable in a large area, and garland too thick will overtake the area. If your column is 8' tall, you'll want garland at least twice that length so that the greenery can neatly wrap around in an ascending circle. To get an exact measurement for the length of garland you will need, wrap a piece of string around your column in the same way you plan to wrap your garland, then measure the string to determine the length you will need. 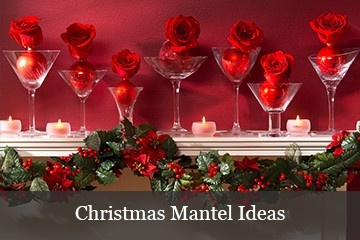 For mantels, measure the space and add at least four feet onto the measurement, two for each side of the mantel, so that the garland can neatly drape over the corners. If you prefer to create a garland swag across the front of the mantel, leaving room for additional keepsakes and decor on the top, you will still need to add extra length to your measurement to ensure an even swag can be acheived. When draping garland along a fence line, a good rule of thumb is to plan for 1.5' of garland for every 1' of fence, this allows slack and creates an even swag across your fence posts. For the most classic of Christmas fence line designs, add a red bow at the top of each swag. This design idea and measurement applies for porch railings and staircases as well. Difficulty Hanging Garland Over Doors? For those who are having trouble hanging their garland over their doorways, try this quick tip: Tie a string (brown or green to hide amongst the greenery) around the inner branch of the garland and then use hooks to hang the strings. The garland should hang easily like this. Want an even sturdier solution? Garland hangers hold tight to each side of the door frame, allowing garland to be secured easily and flawlessly, no tools required! Take a few minutes to conceptualize your entire holiday house design and create a cohesive Christmas look that flows throughout your entire space. Consider the overall design of what you want your house to look like. Consider what you already own. Consider new decorations to replace or supplement what you already have. Consider the overall final design of your house when finished decorating. Remember that it's never too late to turn to Christmas Lights, Etc. We have everything you need for Christmas decorating, including Christmas lights, outdoor decorations and Christmas tree skirts and toppers.